A Grain of Wheat, by Ngugi Wa Thiong’o. London, Heinemann, 1967. A brilliant novel set in rural Kenya as the country formally achieves its independence from British rule and people remember the complexity of their struggle. A novel which challenges conventional narratives about war. For centuries stories about war have followed a predicable pattern. They are adventure stories played out with the highest stakes of life and death. They are about the sharply defined struggle between good and evil, us and them. Honor and sacrifice for those we love are the supreme values. Belief in such stories undergirds our willingness to go to war. Ngugi Wa Thiong’o subverts such narratives with their neat dichotomies. In his hands, the line between homefront and battlefront blurs. We go inside the minds of hero and traitor alike. Women as well as men are changed by the war. Even the British who have treated the Kenyans with extreme cruelty are depicted sympathetically. Ngugi leaves us wondering if victory will be enough to heal the wounds left by the violence. In A Grain of Wheat, the bloody fight for Kenyan freedom from British colonial control has been won, and a village near the Great Rift prepares to enjoy of self-rule. Celebration of “Uhuru” or “Freedom” from the British is complicated by the remembrance of the violence and pain people have known within themselves and at the hands of each other. Mugo is a hermit-like man, viewed as a hero by others but he is a man riddled by guilt and shame over what he has done. Gikonyo and Mumbi were a loving couple until he is taken into detention. When he returns, he has to face that she is not the vision which sustained him in captivity. She is woman with needs of her own struggling to survive in a hopeless situation. Karanja, Gikonyo’s rival for Mumbi, allied himself with the British during the war and gained power over the other villagers. He believed that each person had to survive alone rather than by uniting to struggle against oppression. Acting aggressively against other Africans has earned him their hatred. John Thompson came to Kenya as a British official with dreams of forcing order and progress on the Africans. He was willing to use the utmost cruelty to achieve those dreams, but now he was reluctantly returning to England along with his wife, Margery, whom he has alienated. All of these and a variety of others are struggling to reconcile themselves to what had happened to them and how they had acted under the duress of war. As they interact with each other, they are reaching toward new beginnings. Their struggles make the book guardedly positive rather than depressing. Growing up under British rule in Kenya, Ngugi lived through the Mau Mau wars that led to Kenya’s independence in 1963. 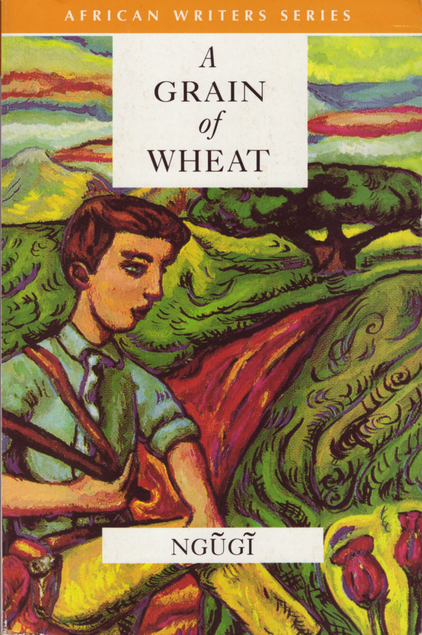 A Grain of Wheat and his other early writings center on the events surrounding his nation’s creation. As Kenya moved into dictatorship in the 1970s, Ngugi changed both his writing and politics. He strongly opposed the dictatorship and was imprisoned for his stance. After threats on his life, he was forced into exile. While teaching in the United States, he has continued to write. Ngugi has been a strong advocate for African writing and African languages. His later novels and plays are originally written in his own native language, Gikuyu. A superb writer, Ngugi is capable of taking readers inside characters whose experiences are radically unlike that of most western readers. Most of the major characters are male, but he shows real empathy for the women. The scope of the novel is only a few days, but people remember and discuss what happened during the years of fighting. Ngugi tells people’s individual stories while blending them into a larger narrative. As the novel ends, he shifts his writing from third person to a communal “we,” turning the individuals’ stories into the communal stories of the village and nation. Often when I read books by Indigenous writers I wonder how people can turn their own painful experiences into meaningful literature. Perhaps creating fine book like A Grain of Sand is a means of dealing with the pain. Perhaps reading such works can help us all understand that pain and empathize with others rather than blindly condemning them. Perhaps we can learn from books like this that victories present their own new sets of problems. I highly recommend this book to all readers for its insight, its excellent writing, and its depiction of war that fits the violence of the post-colonial world. The meaning of the title and the cover of this book are unclear to me. Anyone out there who can explain them for me? ← A Generation Removed: The Fostering and Adoption of Indian Children in the Post-War World, by Margaret Jacobs. I’ve got The Wizard of Crow on my reading list. Have you read that one? No, but I am looking for a copy. It is said by some to be even better than this one. Have you read Petals of Blood by him? An extremely powerful book. I don’t know thr meaning of the title A Grain of Wheat sorry but it’s gone into my wish list. No, I haven’t but I plan to read more of his books. I really liked your review. I’m looking for the next book for my Africa Reading Challenge so I might give this a go. Thanks. I think this is an excellent choice. I don’t understand what you need.